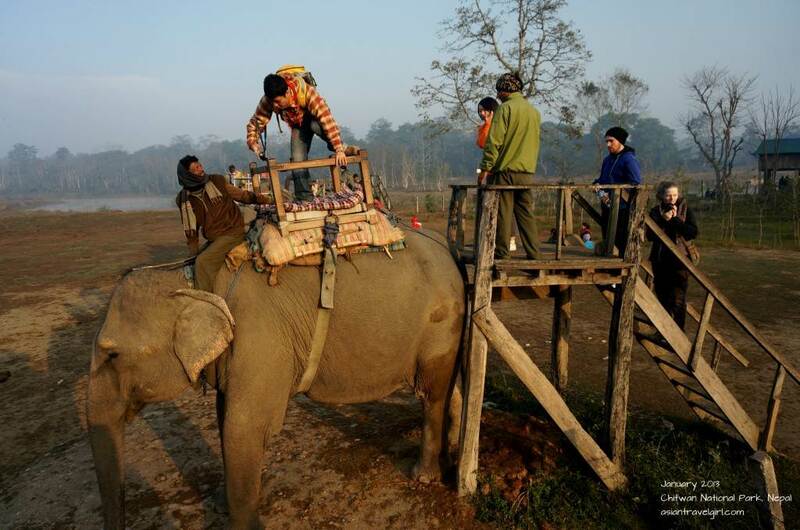 One of the must dos in in Chitwan is animal safari. There are several options available, what ever you choose do not go for jeep safari, it is not like ones you imagine in Africa. it was loud, which scare animals away and we ended up not seeing much. The jeep also broke down several times. We had to waste a lot of time pushing the jeep. Elephant Safari was a completely different story! The jeep broke down on Jeep Safari…never again! 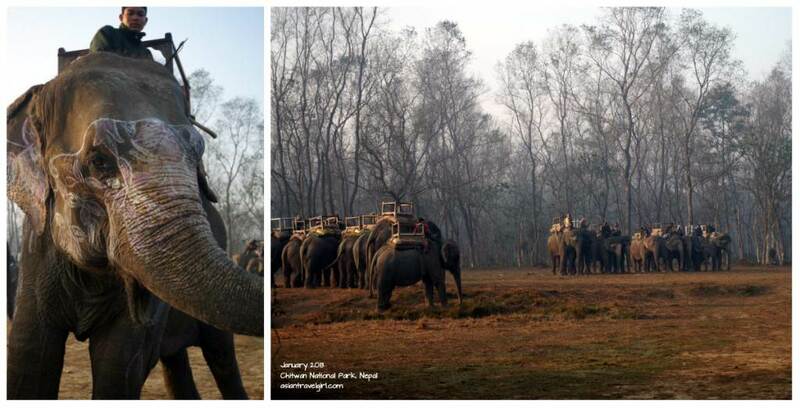 We got up early in the morning and drove towards Chitwan National Park. When we got there, there were many elephants lining up for tourists to get on. It seemed like a good idea at that time (before I came home and read up elephant cruelty in Thailand- sorry animal right activists!). The elephants were a lot bigger than I thought, I understand why lions and tigers would fled from such giant animal. Elephants at the “parking lot” with faces beautifully decorated. 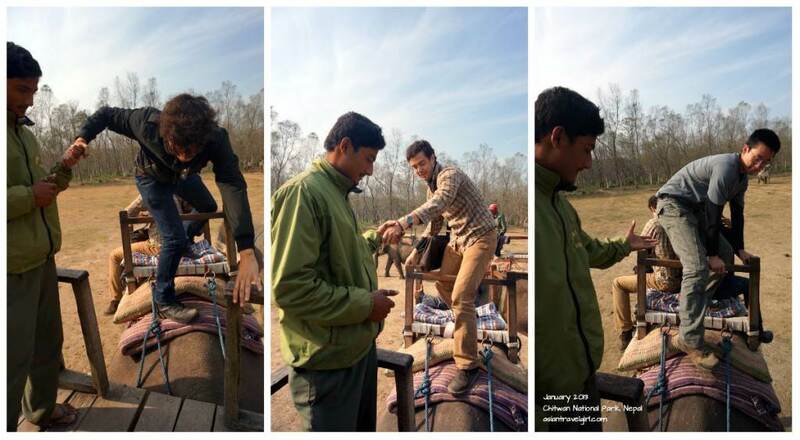 To climb onto the elephant was easy, people here have already set it up for you. There was a platform set up where you climb up the wooden steps and 4 adults sit into a howdah on the elephant. Even though there are safety rail and a post to hold onto, it still felt very unsafe. The howdah was quite small, the last person had a hard time trying to fit inside. Once settled, the elephant sets off. 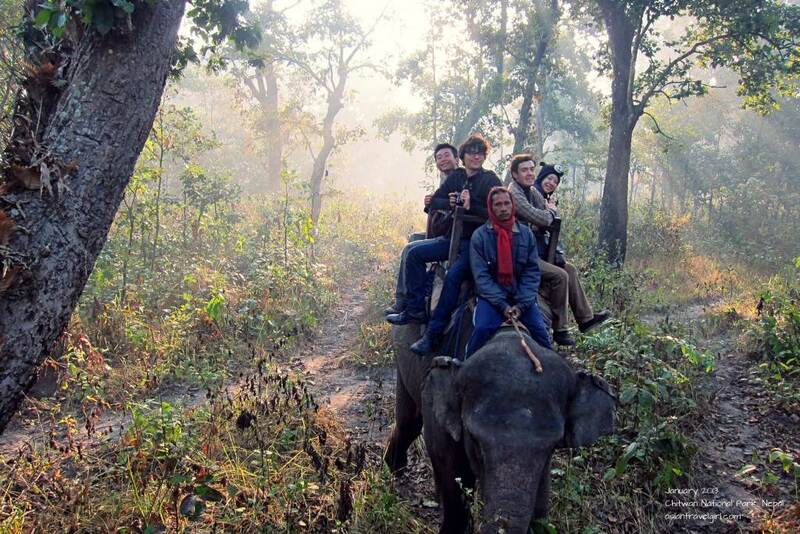 How to get on a 3 meter tall elephant- tourist style. 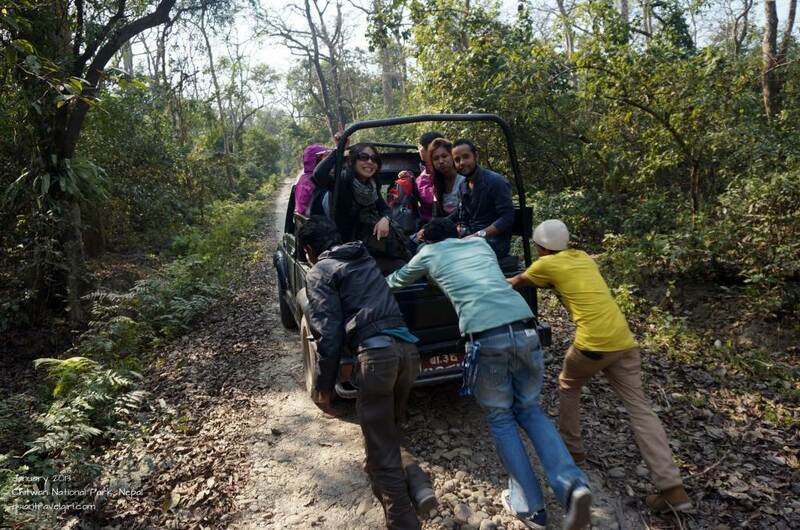 The ride was very bumpy as we followed the movement of the elephant. In layman terms, we were pretty much all snuggled within one tiny basket. On average the elephant was 3 meter high, it was quite scary looking down and when your live is controlled by the animal. We were tipping over backwards and forwards, soon we got used to the movement and really started to enjoy the view. Amazing elephant ride through the tropical jungle. Not long into the ride, we started crossing a river. It was still early in the morning so everything was quite misty. We saw crocodiles lying on the river bank, lazing around. 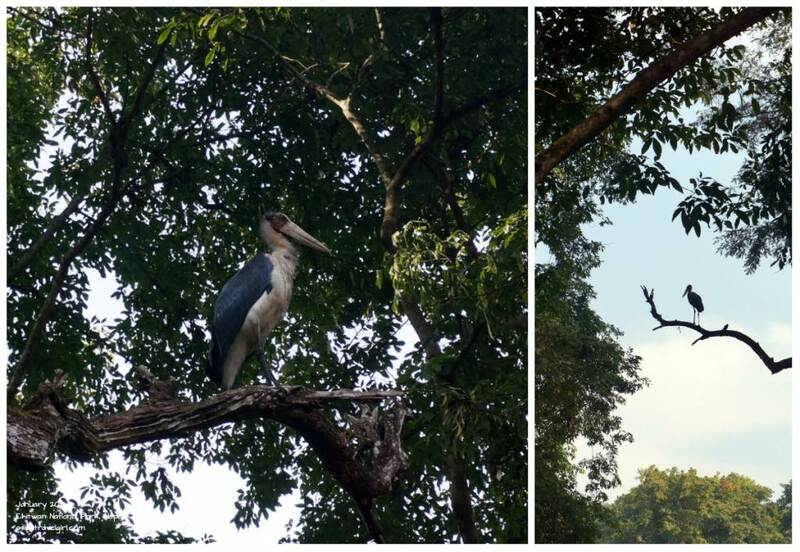 There were also different types of bird species flying around, the only one I could name was the kingfisher. 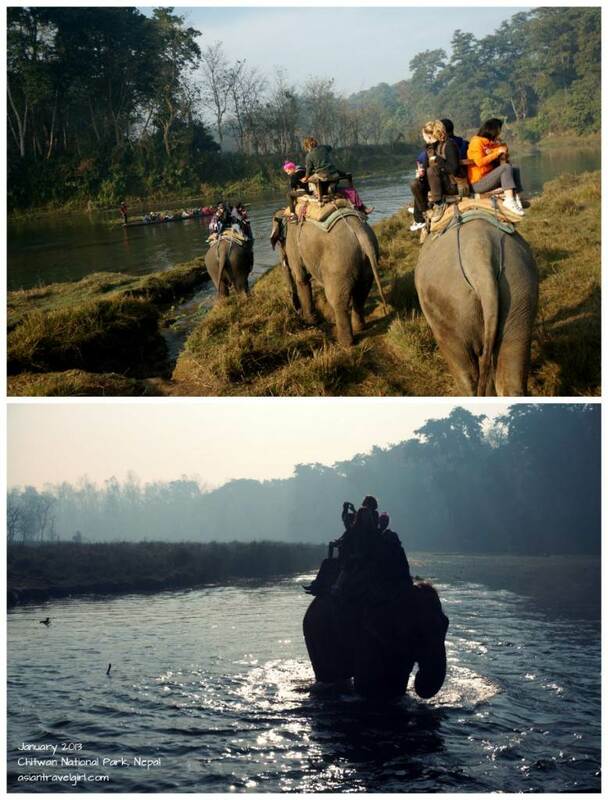 The other activity in Chitwan with elephant involvement was the “elephant shower”, where the elephant splashes water all over you while bathing in the river. I was the only person in the group who did it after the elephant safari. Link to this video post then you will see me getting wet! In a jungle like this, you will be lucky if you spot a tiger or rhino. Spotting a tiger is very rare, we met a guy while trekking through Annapurna region (he is currently working for Apple, California) who went tiger camping himself for 3 weeks, without a local guide too! He had to set up tents on a tree and camp out just to spot them. Was such an inspiring guy. 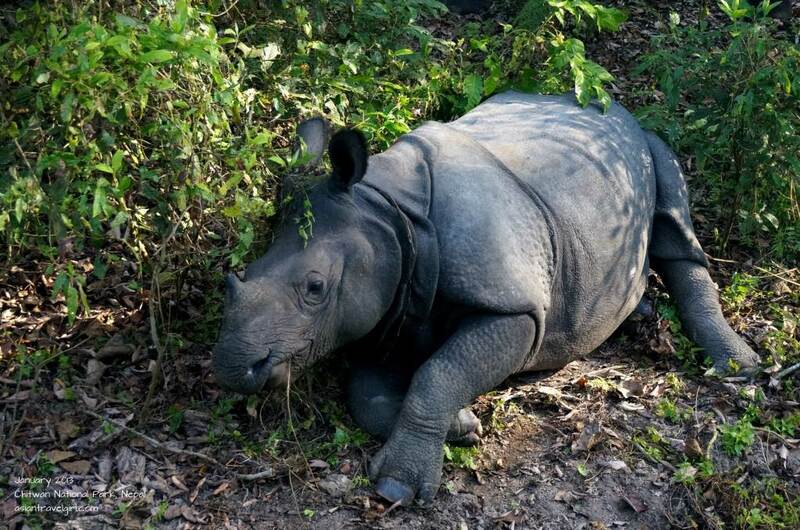 Even though we weren’t so lucky with regards to spotting a tiger, we did saw a few rhinos! That already got us very excited! Random massive bird I spotted. Fun rhino facts. Do you know the word rhinoceros is a combination of two Greek words: rhino (nose) and ceros (horn)? Rhinos are herbivores and can weigh over 3500 kg. White rhinos (despite their name, are actually grey) are the second largest mammals on earth after elephants. We were all amazed at the thick protective skin on the rhinos. They look so pre-historical. Despite being surrounded by several elephants, they just stood there and ate their leaves peacefully. Oh my! What a perfect shot! The rest of our trip wasn’t that exciting. Nothing bets the hype of seeing rhinos real life in such a close proximity. I have concluded that the best way to experience animal safari is to go on an elephant ride. 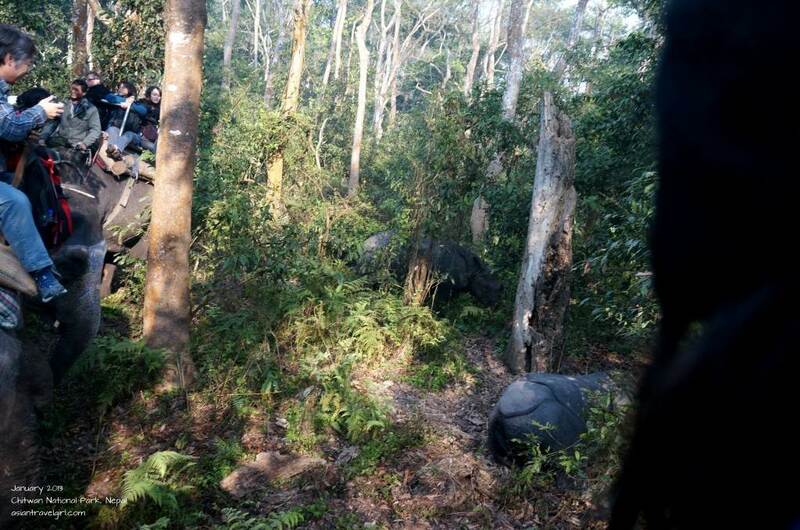 Being on the elephant enables you to move silently through the trees and grassland without disturbing the wildlife. Hence the chances of you seeing creatures are a lot higher. 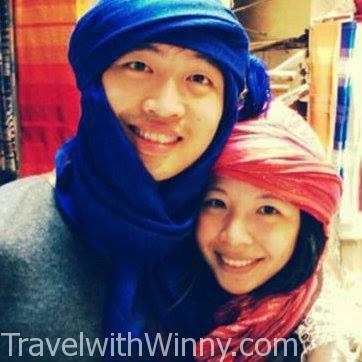 Sometimes its hard not to put morals aside and enjoy the must-do tourist attraction in the area. This is the sort of activity where you had fun but felt a bit guilty afterwards. Getting the boys off the howdah required some support.